Stena Line can trace its history back to Sten Allan Olsson (Stena is a mix of his two first names), who founded a metal recycling company in Sweden, and in 1962 first entered the shipping industry when he took over the Gothenburg â€“ Skagen (Northern Jutland) route from a Danish company, who marketed the route on it cheap food and duty-free shopping with low ticket prices. The popularity of the route soon over took Fredrikshaven, and Olsson expanded with routes between Lysekil/Uddevalla-Skagen, Stockholm-Mairehamn and Tilbury docks and Calais. By 1967 the company started a Gothenburg-Keil route, showing they were a force to be reckoned with. In 1979 they started a Oslo â€“ Frederikshaven route, but the company got involved in a price war with Sessanlinje which it eventually bought out in 1982. A separate company (Stena Sessan Line) was formed by the new CEO, Dan Sten Olsson, son of the founder. Later that year they also bought out Lion Ferries which became another subsidiary. 1983 saw the company take its current name, Stena Line AB under the parent company Stena AB, with increased investment made to increase service levels both ashore and onboard, as well as branching into other travel services such as busses and hotels. Further investment was financed in 1988 by floating the company on the stock exchange in Stockholm. 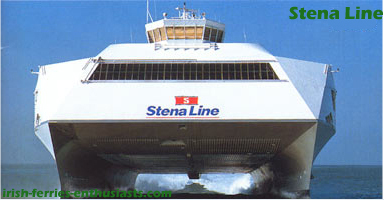 In 1990 the Stena brand arrived on Irish shores when the company bought out Sealink British Ferries (which was part of British Rail), which along with the acquision of some Duch companies doubled the companyâ€™s size in one year, and secured the future of the company in the free trade Europe that was to emerge (which would see the ferry company profits plummet following the abolition of duty free in 1999). While these takeovers were strategically successful, they caused financial trouble for the company, who had to consolidate their accounts between 1992 and 1994.
the Irish Sea by the HSS Stena Voyager, which started running between Belfast and Stranraer reducing the Stena Caledonia to a freight only service (but carrying passengers in bad weather when the HSS couldnâ€™t sail). A freight orientated service started from Dublin port by Stena Challenger. From the first of the year all references to Sealink were phased out. 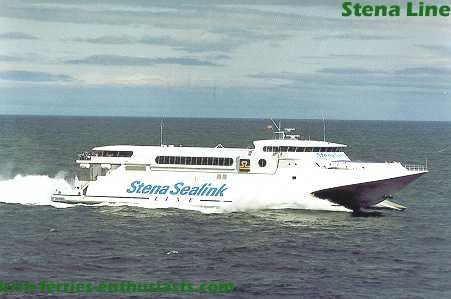 1997 saw what was by many considered the greatest ship to operate on the Irish Sea, the Stena Felicity leave Rosslare for the last time. Felicity, which first arrived in Rosslare on March 2nd 1990 was the largest ship on the Irish Sea, and made carryings rocket overnight with her massive capacity, while dwarfing the B&I ships in the port. She was replaced by the Koningin Beatrix in July â€™97. In 1998 Stena Line joined forces with P&O (forming P&O Stena Line) to take on the Channel Tunnel. Back in the Irish Sea, the Stena Linx came to Rosslare to operate the high speed service. 2001 saw the company again become a fully owned subsidiary of Stena AB when it was delisted from the stock exchange, while the Stena Fordwarder was chartered for the Dublin-Holyhead route, which allowed some passengers to be carried as well as the freight traffic the route was started on. And in 2002 they sold their share in P&O Stena Line, and expanded their North Sea freight routes, along with attempting to take over P&O Irish Seaâ€™s freight routes between Larne to Fleetwood, which eventually got the go ahead from the competition autorities on both sides of the Irish Sea. 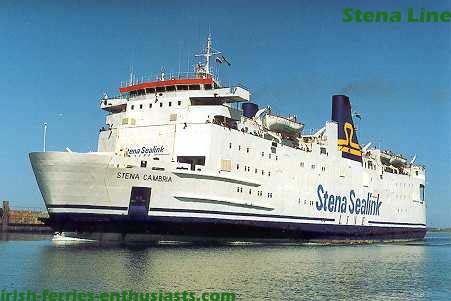 July 2003 saw the arrival of the Stena Adventurer in Dublin (replacing the Stena Fordwarder) on the Dublin â€“ Holyhead route, while in Rosslare the Koningin Beatrix was replaced by the Stena Europe (sister ship of Irish Ferriesâ€™ Normandy also based in Rosslare). During May 2008, Stena Line moved its Belfast Terminal from Albert Quay to the new VT4, reducing the length of the crossing to Stranraer by 10 minutes. In July 2009, Stena Line announced that it had repurchased its former ship, the Stena Parisien, now the Seafrance Manet, from SeaFrance. After being renamed the Stena Navigator and a comprehensive refit she was introduced on the Stranraer to Belfast route, alongside HSS Stena Voyager and Stena Caledonia. In December 2010, Stena Line announced it had acquired the Northern Irish operations of DFDS. The sale includes the Belfast to Heysham & Birkenhead routes, two vessels from the Heysham route (Scotia Seaways & Hibernia Seaways) and two chartered vessels from the Birkenhead route (Mersey Seaways& Lagan Seaways). The Acquisition of the DFDS routes and the closure of the Fleetwood service led to an investigation by the competition commissions in Ireland and the UK, which subsequently cleared the take over and Stena fully integrated the Belfast â€“ Birkenhead route as a full Stena Line service in September 2011. In February 2010 Stena announced plans to relocate the Stranraer service to a new purpose built port in Cairnryan which would also require new vessels to operate the service as their was no provision for the HSS in the new port plans. In November 2011 the new port opened and two rebuilt ferries the Stena Superfast VII and VIII opened the new Belfast â€“ Cairnryan route with a crossing time of 2hrs 15 minutes. For the North Channel this meant the end of HSS operations from Belfast and the final crossing of the Belfast built Stena Caledonia. 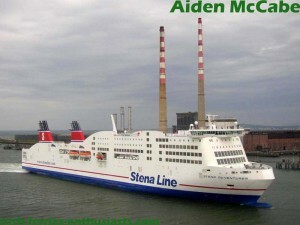 Also in 2011 Stena Line announced that the Dun Laoghaire â€“ Holyhead service would operate on a seasonal basis from April â€“ September using the HSS Stena Explorer on one round trip per day which will hopefully reduce the losses incurred on the route from the high fuel costs that severely affect the profitability of the HSS service.